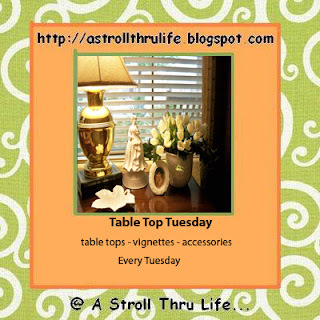 Welcome to the 89th Table Top Tuesday. Wow, you guys all had such fabulous Cloche displays and I drooled over every one. Such fabulous eye candy. Now that you are all warmed up in the Cloche department, don't cool off, it won't be long and it will be time for the Christmas Cloche Party. I will let you know a date. I have had this brass stand for years, but broke the glass insert that came with it, so I looked around my stash and found a cut crystal bowl that I have that fit just perfect. I think it adds a touch of bling to the piece. With Thanksgiving almost here, I thought I had better start to get a few things done in the decor department. 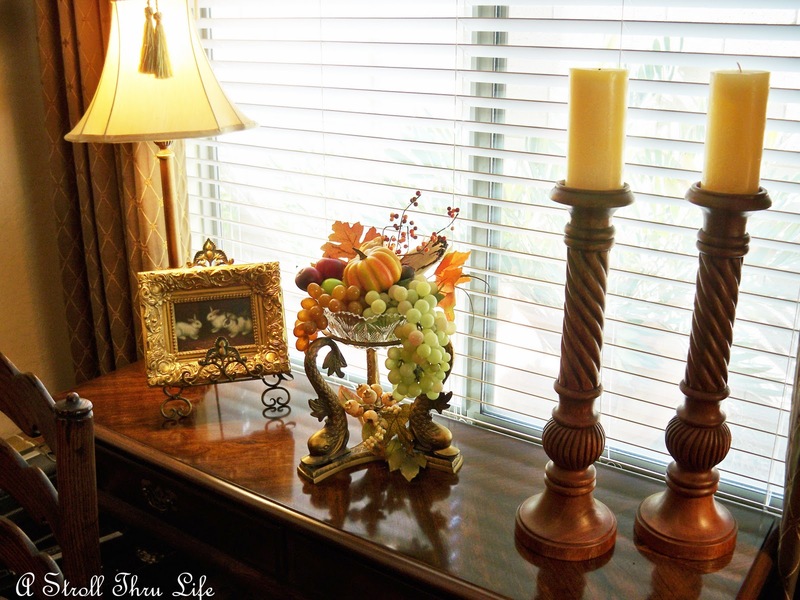 I want to start adding a little more bling and elegance for Thanksgiving and Christmas. I moved the wicker cornacopia to the breakfast table and changed the buffet in the dining area to something a little more elegant. The gold ornate frame on an easel, the super tall candlesticks and the fruit display looks a little more elegant than the cornacopia. I love how real all of the faux fruit looks these days. Both of these sprays of grapes look like you could just pick a few and enjoy. I think placing fruit in the bowl created a fabulous display. I think this is a piece that I am going to enjoy using for a lot of different things. For now I am thrilled with the look of the fruit display, adds just the perfect amount of formality to the buffet. 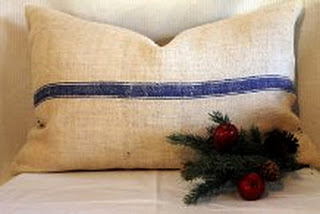 Also a reminder that the French Grainsack pillow giveaway is still going on. Click here to enter. Now, I can't wait to see what you guys have been up to. 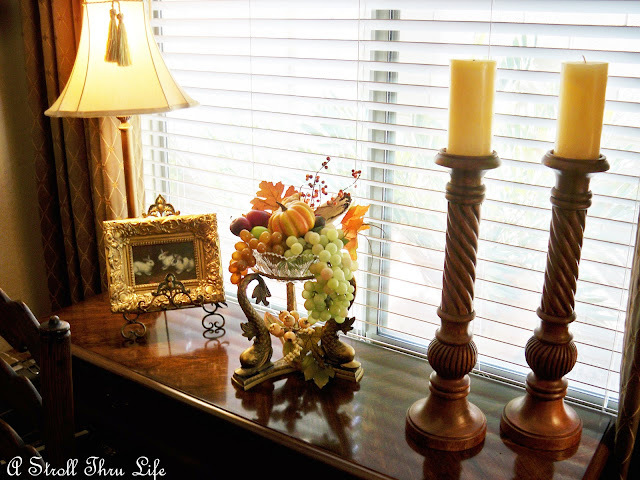 With Halloween over, I am sure you have all been super busy changing all of your vignettes. Can't wait to see!!!! Marty that stand is beautiful!! You always have such elegant vignettes. Thanks for hosting!! So simple and yet so elegant Marty. The grapes do look real enough to fool me! I need to get my thinking cap on and have a Christmas cloche ready for the next party! 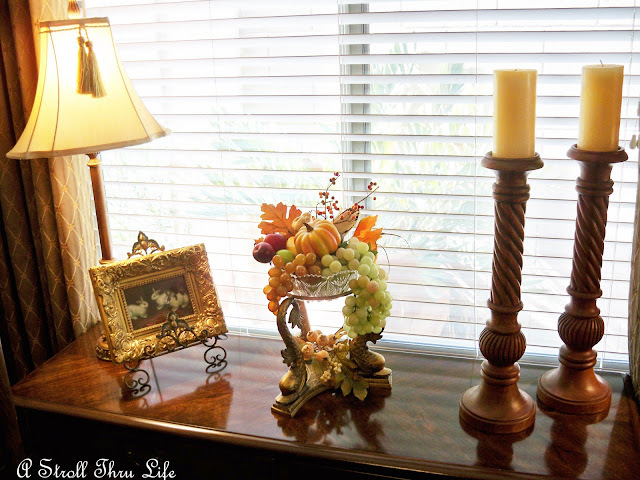 Your vignette is gorgeous...so traditional with the fruit in the crystal! I adore fruit, crystal and traditional. Thank you for hosting this inspirational meme each week! How exciting to hear that your Christmas cloche party is coming up! I can't wait for that one. Thank you for having me today. Happy Tuesday! Hi! I just found your blog and am a first-timer at your party. Thanks for hosting. I'm your newest follower. Such a great idea! I have a stand that I could do this with, thank you for the inspiration. Thank you for hosting us again this week! Thank you for hosting. Mine is a bit of a stretch for a tabletop post, but I didn't want to miss the party. If it doesn't seem suitable to you feel free to delete (mine's the one on new bedside table lamps). Anyway off to check out some of the links! Looks lovely for fall! Thanks for hosting us! That is such a beautiful display Marty! The glass bowl looks perfect and that stand. Thank you for hosting and have a great day! thanks again for hosting this lovely party...Your place looks as gorgeous as ever! Hi Marty! Sorry I linked up twice. I had trouble linking up and tried again, but eventually both tries linked up ~ oops. Marty, that is a beautiful arrangement. Thanks for hosting. Hi Marty! Looks like another fun party. Sorry, but it looks like I linked up twice...if you want to delete one I'd appreciate it. (A Little Bit Rustic) #19 or #28. Guess I was just excited about linking to your fabulous party! ":o) Loved your inspiring post as always...Thank you for hosting! Thank you Marty for hosting. Your home is certainly starting to look festive, and as always beautiful. Just lovely, Marty! Love the glass. What an inspiration to use that gorgeous bowl, Marty! It does make it so elegant. Thanks once again! Just love the pumpkins and grapes, and the compote is beautiful! Beautiful Marty. I love the dish and the faux fruit! I have been breaking things lately also. Just broke one of my largest jars. Darn, I was only washing it. Better be a bit more careful. such a stunning fruit arrangement- so lovely the colors and textures together. Your vignettes are always so beautiful. Thank you so much for hosting! I'm going to have to gear up for your Christmas Cloche Party! Marty, What a beautiful brass stand and the bowl you are using works beautifully. 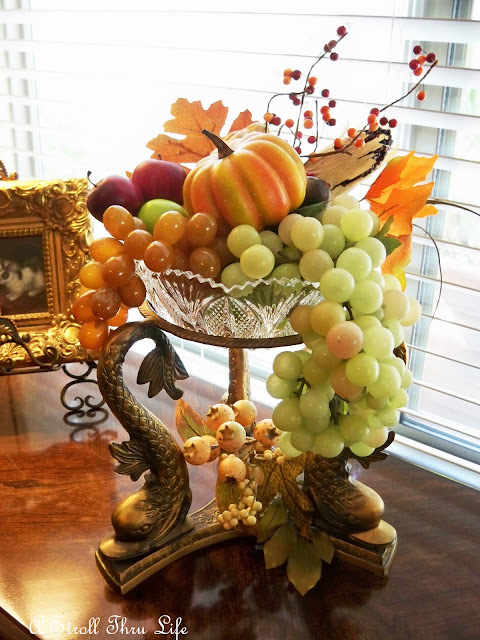 Your fruit arrangement is perfect for Thanksgiving. The cloche party was so inspirational, look forward to your Christmas cloche party. Thanks for hosting. Marty, your vignette on your buffet is very pretty. I love the crystal bowl fruit arrangement. It all looks so elegant together! Everything is so pretty, Marty! Thanks for being a loving hostess! Marty, your stand is so elegant! Thanks for hosting! Stunning stand Marty! I saw it and fell in love with and I right away loved the cut crystal bowl thinking it belonged to it, but you found a perfect one just around the house, wow, so lucky! I love your vignette, it's perfect! Thank you for hosting again and having me. Have a great week. I always enjoy looking at all the beautiful changes you make to your home. Thanks for hosting the party. Such a PRETTY vignette Marty, thanks for sharing it!! You are such an inspiration to us all! Have a great week! Hi Marty; thanks for hosting Table Top Tuesday. I meet your comments on so many blogs, feels like we are old friends saying hi. Great table tops you created. Marty, Your arrangement is so bright and warm. I love the grapes and pumpkins together. What an abundance sign of your warm home, Lady M? Happy TTT & always take care. Your brass stand is gorgeous. Love the fish heads on it. Thanks for hosting the party, it's one of my favorites! 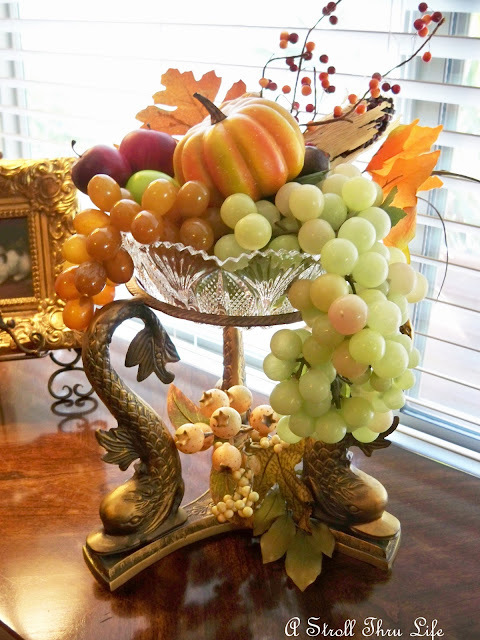 What a perfect thing for a fall centerpiece. Glad you were able to find a replacement dish for the center of it. Your brass stand is gorgeous. The cut glass insert is perfect!! Beautiful! Hi Marty! Thanx for hosting such a fabulous party!! Hope all is well! Just popping in to say hi! All I've done recently is put away the Halloween decorations, which left me with the same fall tabletops that I had before Halloween. So, nothing to link this week. It won't be long before the holiday stuff comes out! Marty, your living room is just gorgeous!! All of your wonderful vignettes are absolutely stunning! Thanks for hosting each week! I look forward to it!! Glad to link up!